Register .EU Domain Name Today! .EU is the country code top-level domain (ccTLD) for the European Union (EU). Launched 7 December 2005, the domain is available for organisations and citizens in EU member states. 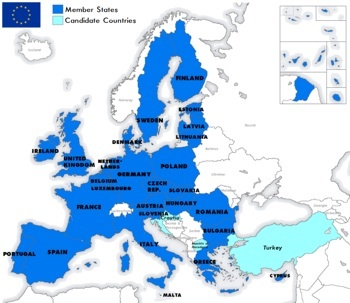 The European Union (EU) is comprised of 27 independent sovereign countries. If your company is already in business in Europe or looking to expand there, registering a .EU domain should be part of your business plan! Why should I register a .EU domain name? The .eu domain name presents a great opportunity for local and international companies wanting to represent their business in European Union. By registering a .eu domain name, your company can provide relevant and localised information about your product and services. Many websites with the .EU extension are pan-European and draw attention to having a 'European identity'. This can be extremely important in showing loyalty to this part of the world. Instead of using a more generic TLD such as .COM or .NET, .EU proudly states your presence in Europe. Registration is open to any person, company, or organization located within the European Union.